I hope you all had a good Christmas and are now rested for the new year. I would like to thank you so much for all the lovely get well wishes. I am on the improve and am looking at getting back into crafting again which is always a good sign. 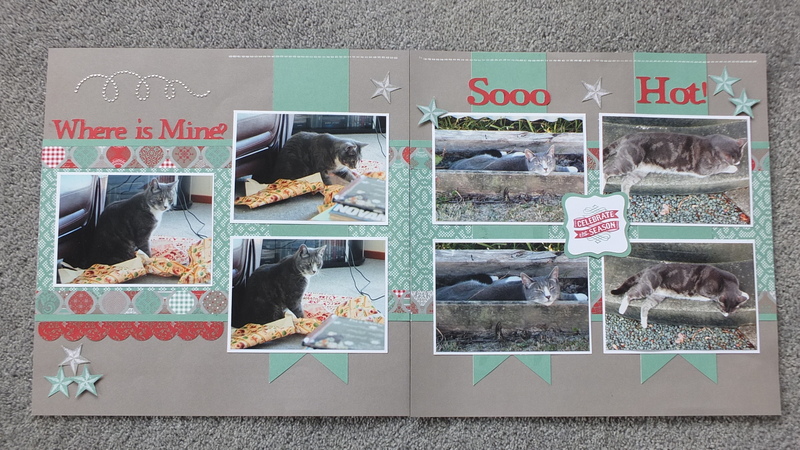 For my last post for this year I am finally using a scrapbook layout. While I a primarily a cardmaker I do enjoy scrapbooking as well. Close to My Heart has really made it a lot easier for me as well. It is so much easier coordinating colours and papers to create fabulous layouts. I am really enjoying using the WOTGs from Close to My Heart and also have found the “Make It From Your Heart” Volumes 1 and 2 books by Jeanette Lynton really useful to use for creating well balanced and interesting layouts for my scrapbooks. I have loved using the Holidays from the Heart WOTG – Sparkle and Shine as the colours and papers are gorgeous. I have completed the two double layouts that are suggested but as they have family members in them that are not happy about having their photos posted, I have used this layout with my cat, Sox, in it. The photos are from last year’s Christmas and we had record high temperatures of 32 degrees. Needless to say we were struggling in the heat and our poor Sox just did not know what to do with himself. Plus, he had to be in the action and not miss out on the fun of opening presents! For this layout I have used the recipe from page 32 “Make It From Your Heart” Volume 2 book by Jeanette Lynton. I have found this particular recipe really useful as I can use landscape photos much more easily. I have also used my Cricut to cut out the titles using Cricut Craft Room to make the letters weld together. These books that are available from Close to My Heart are great when you are struggling for inspiration. There are layouts for all number of photos and the instructions are easy to follow. Here I have added some extra embellishments and titles to help make it my own and kept it very simple to make the photos the focus of the pages. These products in the Holidays with Heart Gift Guide are still available through until December 31st while stocks last. Orders totaling over $150 during the promotion can choose one starred item from The Holidays with Heart Gift Guide for free so it is an ideal time to purchase one of our Cricut Collections or our ink and marker organiser. So be in quick as there are only a few days left before these products are no longer available. I am hoping to get my creative mojo up and running in time to do the Australasian Blog Hop for the SOTM on 1st January which will be good. There are some very talented ladies downunder and it is a real privilege working with them. Enjoy the rest of the year and look forward to more creative gorgeousness next year.